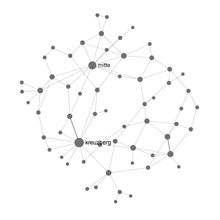 Visualize any text as a network to connect and develop your ideas. Get an insight into the structure of discourse. The next generation tagcloud: you can see not only the main terms, but also the relations between them. Identify the most influential terms and topical clusters, reveal discourse patterns, compare different texts. 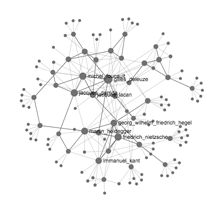 Use the network visualization as a prism to find the most revelant parts of the text. Visualize RSS feeds, web pages, Google search results and Twitter discourse to understand it better. 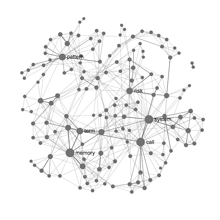 Use the network graph structure insights to identify and study discourse bias. Identify the gaps between what people search for and what they find to create better content and generate new ideas. See what the newspapers are writing about in one glance. Visualize your notes as a text graph, see how they all connect, get an overview of the main ideas. Identify structural gaps in your current discourse to discover how you can take it further. Find the right combinations of keywords to boost SEO levels. Using visual feedback to bring in more choices into a conversation. Quick visual summary of online discourse. RSS feeds from the top world newspapers. Abstract visualization example - notice the different structure of discourse in poetry. Text network visualization of the iconic Martin Luther King speech. 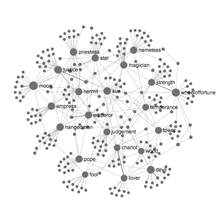 Constellation of relations between philosophers based on how often people search for them. "If you like Tresor you will also like Berghain" kind of constellation for the best Berlin places. Your own constellation of knowledge to retain and connect your ideas. The most interesting techno and leftfield labels, curated by DEM LEEDZ. A constellation with selected highlights from the Kindle book "Survival". Numerological and logical connections between Tarot cards. Estimate how biased, focused or diversified the discourse structure is. Using a combination of SEO and text mining techniques you can identify the gaps in any discourse and create relevant content and identify areas with high innovation potential. How to represent a text as a graph and have a different perspective on discourse. Identify the main topics, see how they are connected, read and study the text in nonlinear way. 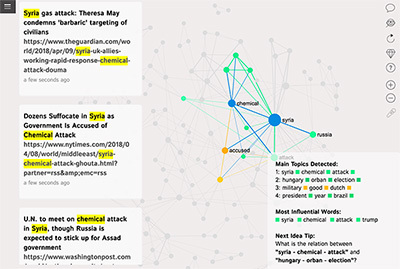 Compare two different texts using text network graph visualization. 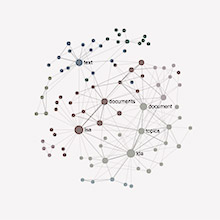 Visualize the connections between all the citations, research notes, and clipped texts. See how to develop the discourse further. Visualize them as a graph to have an overview, find the main topics, and see how they connect. InfraNodus visualizes texts, notes, and ideas as a network, so you can make sense of your knowledge and stimulate your imagination. Created by Dmitry Paranyushkin / Nodus Labs. Read the research papers our text-to-network algorithm is based on and take our online course to learn how it works. This free open-source tool is developed by Nodus Labs (@noduslabs). Contact us to get an invitation code to use this online version or install it on your computer from GitHub. 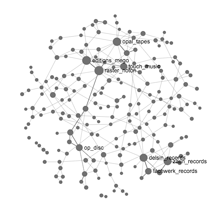 InfraNodus runs on Neo4J graph database, Sigma.Js graph visualization library, Node.Js and uses Textexture text network analysis algorithm.